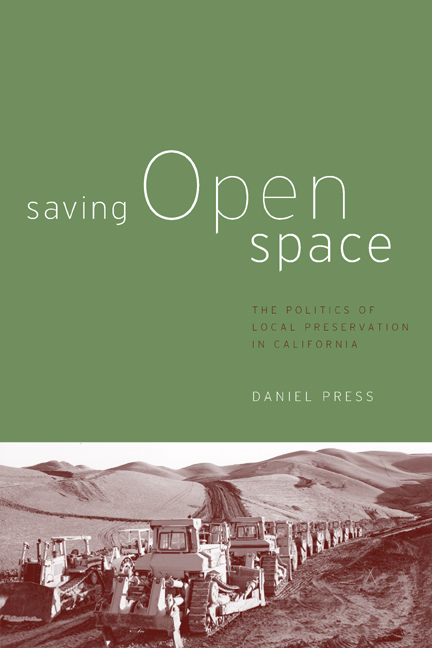 This book is the first to tell the story of conservation by local government and private land trusts in California. It describes the remarkable extent to which communities have protected their landscapes and draws lessons for disseminating successful preservation strategies across the country. Using archival research, in-depth interviews with open space advocates in local government and private land trusts, and a telephone survey of over four thousand California residents, Daniel Press describes land preservation efforts pursued by California communities and explains why some have succeeded better than others. Saving Open Space concludes with policy recommendations based on lessons learned from the preservation success stories. Daniel Press is Associate Professor of Environmental Studies at the University of California, Santa Cruz, and author of Democratic Dilemmas in the Age of Ecology: Trees and Toxics in the American West (1994).